The pinbasic package ships utilities for fast and stable estimation of the probability of informed trading in the static PIN framework. The function design is chosen to fit the extended EHO model setup but can also be applied to the simpler EKOP model by equating the intensities of uninformed buys and sells. State-of-the-art factorization of the model likelihood function as well as most recent algorithms for generating initial values for optimization routines are implemented. In total, two likelihood factorizations and three methodologies for starting values are included. Likelihood functions are evaluated with pin_ll and sets of starting values are returned by initial_vals. The probability of informed trading can be estimated for arbitrary length of daily buys and sells data with pin_est which is a wrapper around the workhorse function pin_est_core. No information about the time span of the underlying data is required to perform optimizations with pin_est. However, the recommendation given in the literature is using at least data for 60 trading days to ensure convergence of the likelihood maximization. 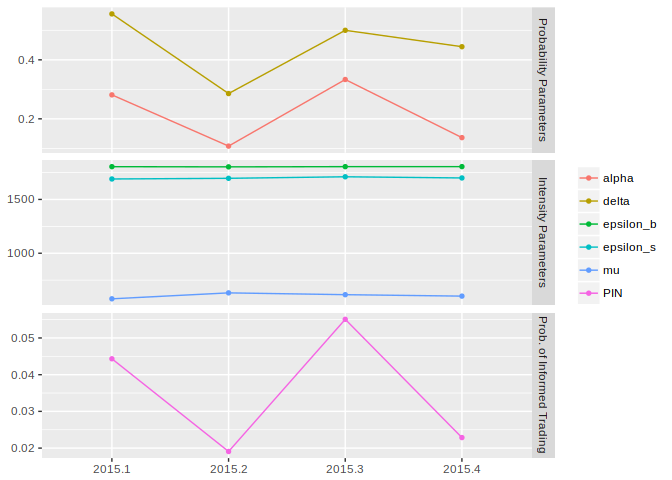 Quarterly estimates are returned by qpin which can be visualized with ggplot. Datasets of daily aggregated numbers of buys and sells can be simulated with simulateBS. Calculation of confidence intervals for the probability of informed trading can be enabled by confint argument in optimization routines (pin_est_core, pin_est and qpin) or by calling pin_confint directly. Additionally, posterior probabilities for conditions of trading days can be computed with posterior and plotted with ggplot. The dataset BSfrequent cover 60 trading days and represent a frequently traded equity. Model parameters and the probability of informed trading can be estimated with pin_est. 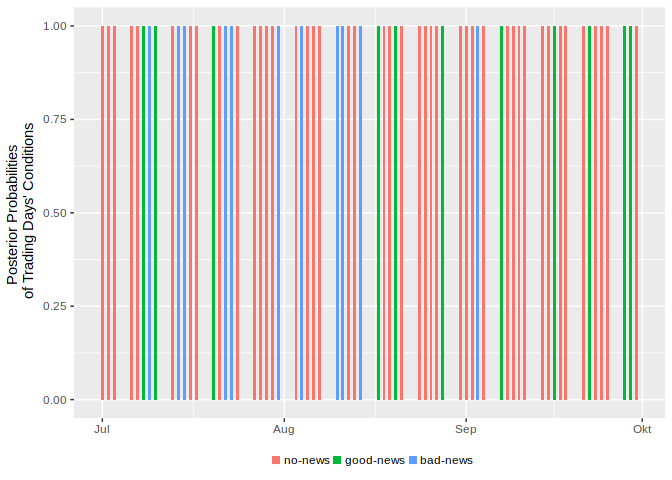 BSfrequent2015 contains simulated daily buys and sells for a frequently traded equity for business days in 2015. qpin returns quarterly estimates which can be visualized with ggplot. Posterior probabilities of trading days’ condition are returned by posterior and can be displayed with ggplot. The following code chunk shows how posterior probabilities for BSfrequent2015 in the third quarter can be calculated and visualized.